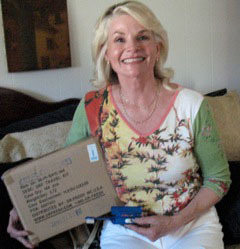 In July, Mary Jane Stolte delivered 864 toothbrushes that were donated by Dr. Brattesani, a local Sonoma County dentist. Thank you for your generous donation, Dr. Brattesani and thank you Jane for your part in making the donation possible. You have made a difference in the lives of children by following through with an inspirational idea. In some rural areas of Nepal many children have never seen a toothbrush. A soft stick that becomes fibrous after use is utilized for cleaning teeth. Imagine that! We delivered the toothbrushes to a rural school in Nepal after learning of the childrens' need from a faith-based NGO working in Nepal. A portable tourniquet system was purchased by CMAF for $1,300 and donated to Kathmandu Model Hospital. This portable unit is used when working on extremities. It is a factor in reducing surgical time and making the surgeon’s work easier. Thank you to Delfi Medical, the manufacturer, for discounting the retail price by 50%. Thank you to Med Share for donating sutures and surgical instruments to CMAF. These medical supplies were delivered recently by CMAF CEO Carol Vernal to Dr. Pawan, Namita (a surgical nurse) and CMAF co-director Dr. Shankar Rai. These donated items are essential in providing corrective surgery at no charge to families whose children have disfiguring birth defects.